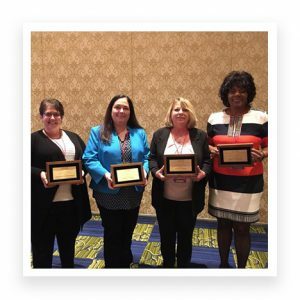 Four scholars from the College of Education’s Business/Marketing Education program in the Department of Curriculum and Teaching were recognized for their paper, Factors Contributing to Stress of Business/Marketing Educators. The paper was selected to receive the Business Education Research Award at the 2018 Business Education Research Conference. The conference was held in Baltimore, and the award was presented on March 28, 2018. to be held in conjunction with the National Business Education Association Convention in Baltimore, MD, March 27-31. Pictured from left to right are S. Elizabeth Alley Diamond — Auburn University doctoral student and GTA, Business/Marketing Education; Dr. Elisha C. Wohleb – Auburn University Associate Clinical Professor, Business/Marketing Education; Dr. Leane B. Skinner – Auburn University Professor, Business/Marketing Education; Dr. Bonita M. Johnson — Auburn University Career and Technical Education Ph.D. graduate, and Instructor at Southern Union State Community College, Opelika, AL.